Amazing - 84% of the children seen here continued on to Black Belt! Parents love our children's program. Instructors at the Academy are not only Black Belts, they are certified instructors. Patience, consistency, leadership by example, respect – these are the skills our instructors bring to every class. We bring out the best in every child. Master Hardy believes that children live up to our expectations, and for 20 years we have had high expectations, and as a result we are proud of the accomplishments of every child in our program. Children love our program. Each child is treated with respect, expected to put 100% into every class, and knows they have earned every belt. Our motto is "Where Belts are EARNED". The value of hard work is not only taught here, it is learned here. "I started seeing improvements from Tae Kwon Do the day my son Joey joined. I signed him up because he was not interested in any other sports and I wanted him involved in something active. I was glad he enjoyed it and took to it the first day. My decision to join with him was a great decision. Being actively involved with Joey has given us much quality time sharing something positive and good for us mentally and physically. As time went on, my daughter Rachel showed interest and now all of us can share the experience of Tae Kwon Do. It's become a family thing and we all help each other grow and learn. I am very proud of both my kids." The above testimonial was written in 2006. 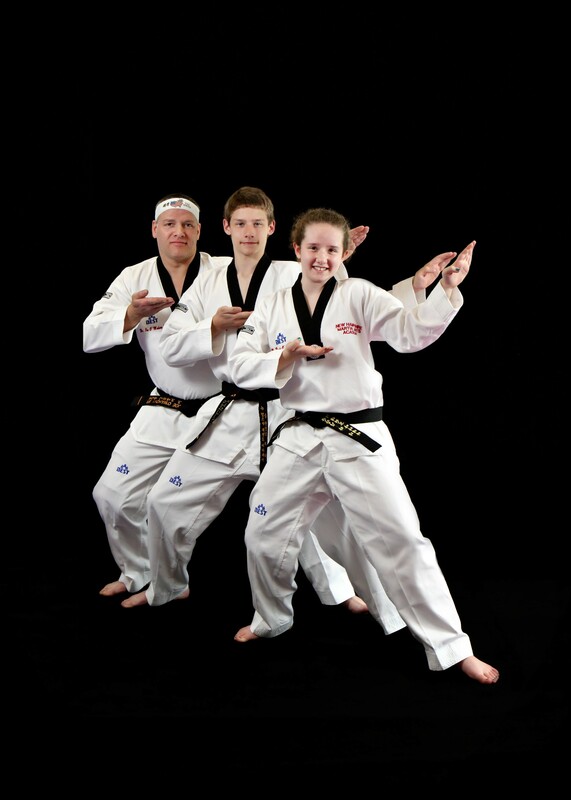 As of now, 2013, all three are Black Belts and Joe and daughter Rachel are teaching classes. Rachel plans on becoming a Master Instructor. Tae Kwon Do is the Korean art of self-defense, practiced by millions world-wide and now a full medal event in the Olympics (since 2000). There are two styles of Tae Kwon Do, commonly known as ITF and WTF. Most schools focus on one or the other. The Academy is lucky to have Master Hardy, who has studied and competed in both styles, and teaches both at the Academy, with the main focus on WTF, otherwise known as Olympic style. Students are exposed not only to the Olympic style full contact sparring, but also to point sparring. This exposure to two styles provides complete Tae Kwon Do instruction. Exclusive to the Academy are our video training clips. Students can view Master Hardy over the internet executing all the techniques they are learning, at their convenience. This is an excellent supplement to classroom training, and assures students practice properly. Tae Kwon Do literally means "art (or way) of hand and foot". This art is the ultimate in self-defense and physical fitness for men, women and children. By involving the whole body, Tae Kwon Do trains the muscles to work in harmony with the mind. Tae Kwon Do promotes strong, resilient spirit, developing leadership qualities for every aspect of life. This is due to the Academy's unique philosophy of self-control, kindness, and humility, which accompanies the physical grace and power of the self-defense skills taught. Not only is Master Hardy the only Olympic Tae Kwon Do instructor in the area, she is also the 2000 World Cup Gold Medalist, has trained National Champions, and posses the qualifications, expertise, experience and know how to get you to Olympic level. Do it for fun, do it for fitness, do it to compete, but whatever the reason, make sure you experience all that our program has to offer. Give us a call and tell us you read about the TWO MONTHS FOR THE PRICE OF ONE offer on the website. Our Pre-School program for children 5 and under builds focus, balance, teamwork, discipline, self-control, confidence, hand-eye coordination and provides interaction with other children, stranger-danger and self-defense, exercise and energy release, self-esteem, manners and respect. Parents love our children's program. Instructors at the Academy are not only Black Belts, they are certified instructors. Patience, consistency, leadership by example, respect – these are the skills our instructors bring to every class. Students can view Master Hardy over the internet executing all the techniques they are learning, at their convenience. This is an excellent supplement to classroom training, and assures students practice properly. By involving the whole body, Tae Kwon Do trains the muscles to work in harmony with the mind. 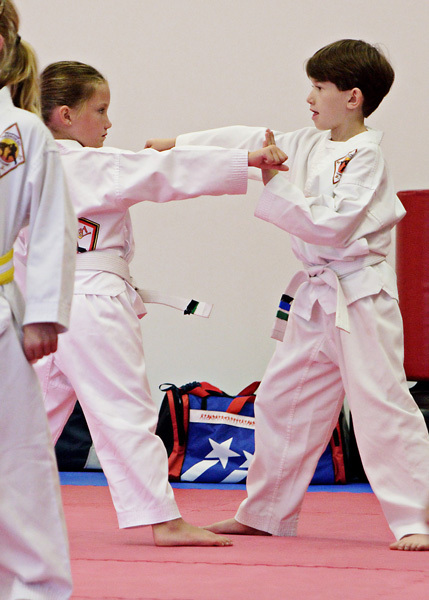 Tae Kwon Do promotes strong, resilient spirit, developing leadership qualities for every aspect of life.